In the past, Home Automation was mostly about entertainment. Home theaters that can cue up a movie and darken the room with a flip of a switch. Wireless networks that allow music to be streamed from any room. Recently, though, automation has become synonymous with energy management. Thermostats that automatically raise and lower the temperature based on the time of day. Blinds that close when the sun goes down. Homes used 21% of US total energy demand in 2012. Managing the residential sector is an important priority for addressing global warming, conserving resources and improving energy security. A lot of energy is wasted, for example heating/cooling and lighting of unoccupied houses and rooms, and overheating or overcooling to make up for temperature variations. IT enabled monitoring and control technologies have played an important role in eliminating similar kinds of inefficiencies in commercial buildings, so it is natural to think that these systems could have an important role in the home. Most homes use energy control technology is at least 20 years old. Only about a quarter of US homes even have simple programmable thermostats. Networked thermostats, power meters and switches, and zone heating can provide information on energy use and allow it to be controlled for distribution only when needed. In addition to direct energy savings, homes can participate in peak shifting. Redistributing electricity demand more evenly throughout the day reduces the needs for energy infrastructure. There are big gaps in consumer communication which the smart grid can help close. Utilities sell electricity in many ways; but have little concept of how individual customers use it. Customers use products & services; but have little concept of electricity use or value. Products and services use electricity; but have little concept of how and when to conserve. Interoperability and Home Area Network Standards are becoming critical. Many utilities want people to be able to shop for smart thermostats, smart appliances and other smart-grid technologies, if everything is proprietary that becomes much more problematic. Controller - Provides a gateway between a variety of standard interfaces found in residential and commercial applications: Abstracts devices and their protocols to a common object model representation so relationships between disparate devices can be made by director. Energy Awareness - the ability for products to automatically react and share information with consumers as it relates to changes in electricity prices and activation of demand response events. Extending the meter into the home will require a new class of products that feature energy awareness. Energy Services - Energy Services bridge the gaps by giving the customer the ability to meet demand requirements and personal goals regardless. 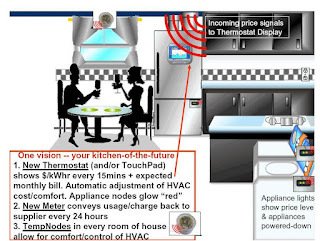 H2G – Home to Grid – market segment that connects consumer products and smart meters. 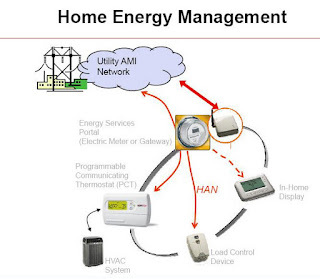 HAN – Home Area Network - From the perspective of energy use, the term Home Area Network was coined to address connectivity between consumer products and smart meters. It covers any means by which a utility customer interconnects devices within a home. Interaction of consumer-owned devices, including distributed energy resources, with the Smart Grid Connecting products to smart meters requires development of an entirely new class of consumer products that are capable of being networked together using one or more communication protocols. Home Controls - A broad market opportunity encompassing Security, Home Theatre, and Home Automation as well as Energy Management. HEM - Home Energy Monitoring device. IHD – In-Home Display - This can be a simple LCD device that just passes information to the user or it could be a widget on an HD television. Kill-a-Watt - An individual appliance measuring device for analyzing individual appliances and loads one at a time. NILM - Nonintrusive Load Monitoring - A process for analyzing changes in the voltage and current going into a house and deducing what appliances are used in the house as well as their individual energy consumption. Electric meters with NILM technology are used by utility companies to survey the specific uses of electric power in different homes. NILM is considered a low cost alternative to attaching individual monitors on each appliance. It does, however, present privacy concerns. Quadruple Play - Back at the start of the century, telecommunications companies described the “triple play” (voice, video, data) opportunity –- a convergence of all media into the home, provided by a single vendor, and streamed onto a variety of consumer devices (phones, TVs, computers, and more). The Smart Grid is the first opportunity to enable the “quadruple play,” made possible by the use of standards-based, scalable smart grid architectures that connect and leverage feature-rich devices and functionality, along with high-bandwidth (and low cost) 4G networking. Smart Appliances - Energy aware products that allow consumers and utilities to shape electricity loads during peak periods. ZigBee SE – Smart Energy Profile defines the standard behavior of Home Area Network (HAN) devices. According to a Navigant Research report released in September 2015, while the HEM market has struggled to gain traction in the past, particularly from a utility standpoint, it began gathering momentum in 2014 and continues to grow as consumers find value in its technologies and services, including home energy reports, web portals, and in-home displays. Though some companies in this market have left to pursue other goals or have settled into niche roles, two vendors stand out among the competition. 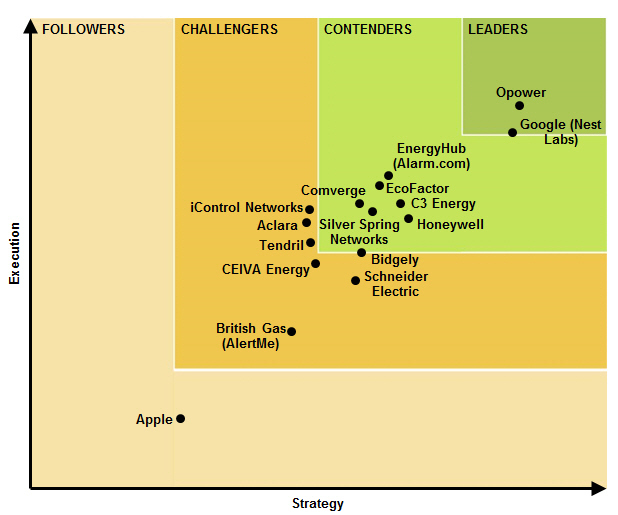 According to a new Leaderboard Report from Navigant Research, Opower and Google’s Nest Labs lead the HEM vendor market in terms of strategy and execution. Studies show that giving people direct feedback on their energy use leads to a reduction in energy consumption of 5-15%. Home Energy Management will make it possible to get instantaneous pricing information on the electricity that is being used and to scale electricity consumption accordingly. The Smart Grid is a key enabler in communicating peak prices to consumers; and integrating smart appliances with the grid to help customers change their energy consumption habits. Evolving into an open eco-system where the devices can come from any provider whether that’s from the utility, or Best Buy down the street or from the appliances that come with the home. Key is to enable them to communicate in real time. What matters is the data (about consumption) and control (i.e., automation), not the HAN hardware; . The endgame should focus on building intelligent, automated energy management, not filling the home with a slew of new, narrow-purpose HAN devices. Clearly, the overall trend is toward feature convergence -- more goodies on a few broad-purpose digital platforms. Look at today’s smart phones. Most include GPS, motion sensors, Wi-Fi, cameras, audio players, and you can load almost any clever app you can think of. They are a platform for innovation. Is home energy management an innovation platform or an innovation to add to other platforms? Seems to me we’ve got quite a few platforms already, and they are pretty darn good already. Reduced Energy Use - Various studies have shown a reduction in home energy use of 4-15% through use of home energy display. For example, a study using the PowerCost Monitor deployed in 500 Ontario homes by Hydro One showed an average 6.5% drop in total electricity use when compared with a similarly sized control group. Identify Baseload -Some of the composite parts of the baseload or standing heart rate of the house are comparatively small, but anything that runs 24/7, even low wattage, adds up. Identify Anomalies - Sometimes people leave something on that shouldn’t be. By knowing a home’s standing heart rate, it is very easy to identify when something’s been inadvertently left running. This point alone makes the case for real-time monitoring: figuring out the next day that you’ve left a space heater on in the basement is not so helpful. is as true with energy as with anything else. One of the key aspects of real-time monitoring is that it lets you know immediately the impact of your daily activities. Reducing the dryer heat from high to medium has a significant impact on electricity. When they are measurable, those shifts become tangible, and you look for more opportunities. Environmental Monitoring - Multiple benefits/value are needed. HEM should answer a market need, solve real problems, beyond 'carbon guilt'. There are specific problems that improved environmental monitoring could mitigate in addition to helping homeowners keep energy costs down. There are 250,000 freeze events per year costing insurers dearly and countless mold claims as well. Offering temp/humidity alerts could potentially reduce insurance costs while being part of the system helping keep residential energy costs down. Lukewarm Consumer Interest - the less-than-stellar consumer response to various efforts to market energy saving home devices in the past. Integration With Other Home Controls - A broad market encompassing Security, Home Theatre, and Home Automation as well as Energy Management. Homeowners would like these devices to work together, not one use case wonders. Low powered wireless networks are designed for low power so that batteries can last for months and years, not for broadband. The consumer does not want more complexity. 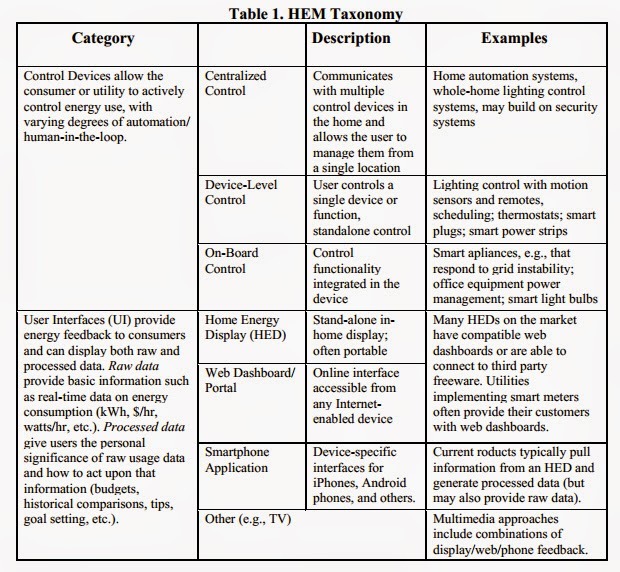 Device Clutter - Companies that are tied to home energy management consoles are most at risk. Most homeowners would prefer to see energy information on their smart phones, computers or TVs and don't want a new, single-purpose device cluttering their counters. Low Consumer Price Points - A 2009 survey shows that Americans were willing to pay an average of $48 for equipment that allows them to manage their home energy use. That price might be hard to meet, depending on the technology being deployed. Interface that’s easy to understand and intuitive -- for many sectors of society. Control strategies for a house that can react to the possibility of low in-house network quality or complete network failure. Privacy – Finding right balance between security and simplicity. Limited Residential Demand Response Potential - Consumers are largely at work during peak periods: Thus, there is far less than can be harvested from consumer demand response. Commercial DR programs tend to work because factories and large commercial buildings use a lot of electricity and can curb power consumption at peak times. However, due to the Duck Curve, the peak in California will shift later in the day in the future with the peak time when people get home from work. Who owns the customer? Utility, ISP, Retailer? Business model? Pay to play, freemium or “Gainshare”? Consistent Experience - Customers would like to go to one place to manage energy usage, control devices, and plan actions. The Web will play a critical role as a cost effective medium to deliver rich information. A consistent Web experience across AMI, DR, EE, and HAN programs is required to engage customers. Real Time/Two-Way Communication – So that all the devices that are inside the home can be controlled by the user and also be accessible by the utility or at least be able to respond to signals that might come down. Real Time Information - Provides direct access to usage data. Get near real time electric use data from AMI meters. Real-time leads to a real map of action. Focus on Small to Mid-size Commercial Customers - Big industrial sites and big high-rises already have energy management systems and tie-ins to utility programs. But many smaller commercial properties are still not fully on board. And many utilities believe that it will be far easier to convince commercial property owners to play along than to convince residential customers to change their energy behavior. Microsoft - Redmond, WA - Launched the beta version of its new Hohm online energy management application in June 2009. Hohm was designed to help U.S. utility customers better understand their electricity and gas usage, receive recommendations, and start saving 5 percent to 10 percent on their bills. The program was expected to eventually be offered worldwide and include water usage, electric cars, homes, home devices and appliances, and commercial buildings. Hohm’s business model was expected to generate revenue from advertising. The site includes a section for sponsored and general vendors compiled from Microsoft’s Bing search, along with a rating system. Hohm was built on the Windows Azure cloud operating system, a platform for developers of Web applications. Limited initial use. One of the upsides of the Microsoft Hohm system was that any consumer could access it by putting in their zip code and adding in various other bits of information like size of home, etc. The tool then started giving you immediate feedback on how you could be more energy-efficient, based on just this data and using the algorithms Microsoft licensed from Lawrence Berkeley National Laboratory and the Department of Energy. However this initial step — before you connected it with your utility account or added in a Hohm gadget — didn’t really provide much use. Utility barrier. Like with Google PowerMeter, utilities just didn’t seem to embrace the Microsoft Hohm tool. Microsoft’s large brand could have been seen as threatening by utilities, who want to own the relationship with their customer. Hohm works best when it incorporates customer-usage data fed directly from partner utilities, which, in Microsoft’s case, are currently limited to the Sacramento Municipal Utility District, Seattle City Light, and Xcel Energy. Early Days It’s still early days for the market for home energy management. Internal Politics - Microsoft blogger M.J. Miller explained in a blog that Microsoft decided to end its Hohm online power-savings software utility because "it didn't fit into the Windows Embedded business model." As technology site Ars Technica noted, "the timing of the announcement suggests that Microsoft only developed Hohm for strategic reasons." Over-ambitious long-term plan. While Hohm had limited use in the initial steps, its end goal was very ambitious. Microsoft was trying to turn Hohm into an entire platform that brought in revenue for the company, and which would turn Hohm into an operating system for everything from electric cars, to homes, to home devices and appliances, to commercial buildings. Adding value for consumers and utilities needed to be worked out before moving on to the next steps. The normal Joe on the street isn't quite ready to make room on his handset for an application that allows him to view his bill or see his energy consumption. Now, is this coming? Absolutely. My question is really one of who will have to pay for the application? I don't see him needing one to pay the bill, as the bank or credit card company already does this. But what about energy consumption, being able to lower/raise house temperature remotely if away? This will be a cool one. Yet I believe it will be the thermostat folks that pay to have this application and offer it for free if you purchase their device. -NYSE - The global leader in cloud-based software for the utility industry, Opower’s Energy Efficiency program includes Home Energy Reports (HERs) that pair behavioral science with big data analytics to provide residents with information on their energy usage and empower them to track their energy consumption over time. Customers also have the ability to compare their usage to similar homes and create personalized energy-saving plans. Enroll connected thermostats already installed by connected home service providers in your load control program. Control4, Salt Lake City UT - Provides automation and control solutions for the connected home in the Untied States, Canada, and internationally. The company offers Control4 solution that functions as the operating system of the home, integrating music, video, lighting, temperature, security, communications, and other devices in the home automation market. Its Control4 product line comprises the Control4 home operating system and the associated application software, and software development kits (SDK). The companys software components include Director for monitoring and receiving events; Navigator that displays graphical user interfaces; Composer Express tool that simplifies the set-up process for Control4 home automation installation projects; and Composer Professional Edition, a software application to design, configure, and personalize configuring Control4 home automation system. EcoFactor Redwood City, CA - the leader in cloud-based home energy management services, The EcoFactor Proactive Energy Efficiency service uses data collected from Internet-connected thermostats to run patented energy algorithms, and automatically minimizes homeowner energy consumption. Their algorithms understand not only how individual homes heat up and cool down, but also the consumer’s comfort preferences. They then use this information to make small setpoint adjustments in real time, giving consumers the energy savings they want, without requiring the customer to constantly monitor and adjust their thermostat. C3 Energy- Redwood City, CA - transforming the energy value chain – by applying the technology advancements of big data, cloud computing, analytics, machine learning, and social human-computer interaction models, our customers are realizing the full potential of their energy system investments. C3 Energy enables energy companies to realize the full benefit of their IoT and system investments. C3 Energy applies the power of big data, advanced analytics, social networking, machine learning, and cloud computing to improve the safety, reliability, and efficiency of power generation and delivery. It is transforming the energy value chain with a family of tested and proven SaaS applications built upon C3 CyberPhysix™, its comprehensive design, development, provisioning, and operating platform for deploying industrial-scale cyber physical applications for the energy industry. C3 Energy delivers end-to-end solutions across the power and oil and gas value chains. Their goal is to make the Internet of Energy a reality. Honeywell - Morris Township, NJ - The number one choice of homeowners and the world’s leading brand for temperature control, continues its tradition of excellence and quality with our customized energy management solutions. Why pay to heat or cool your home when you aren’t there? Honeywell Z-Wave® thermostats can automatically adjust every time you arm or disarm your security system. You can also set scenes and schedules for energy savings and receive alerts on your smartphone or mobile device when settings are changed or if the temperature exceeds a specified range. Comverge - Norcross, GA - (CNSI) -NasdaqGM - Named number one demand response company by Navigant. insight into and control over the household energy footprint. The in-home wireless network allows appliances and electrical outlets to talk instantly and directly to a home energy monitor or web portal and enables understanding and management of energy consumption. With the consumer portal, Tendril Vantage, the home wireless network can be remotely monitored and controlled down to each individual device. Tendril Networks received $12 million VC funding in 2008 to develop smart grid networking products. 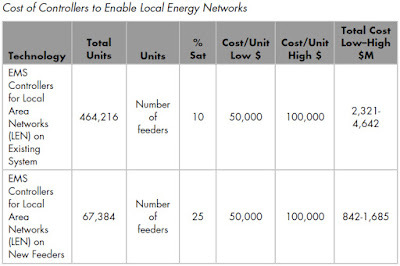 In August 2011, Tendril announced the launch of the Tendril Connect™ Platform Application Developer Program, which will allow select developers to build on the Tendril Connect cloud platform to deliver innovative energy applications to more than 35 utilities and energy service providers, representing a market of 70 million addressable households across three continents. In addition, Tendril announced that it is sponsoring the Cleanweb Hackathon on Sept. 10-11 at pariSoma in San Francisco, and will provide its platform APIs as well as a data set to participants to test drive Tendril Connect. “We’ve opened our APIs and invite application developers to use them to engage with the mass-market energy industry to unleash the next killer app,” said Adrian Tuck, CEO, Tendril. IControl, Palo Alto, CA - Will offer utilities direct consent-based access into customers’ homes and let homeowners monitor and control energy use though a website, in-home touch-screen or “smart phone.” An offering called Connected Life Energy Management, that was released in Novmeber, will be marketed to utilities, cable and telecom broadband providers and homesecurity firms. iControl was founded in 2004 and focused on home security, home monitoring, energy monitoring and elderly care. Each involves a home network. IControl raised $23 million in a Series C round and investment partners include Intel, home-security giant ADT, cable broadband provider Comcast, networking firm Cisco Systems and GE. In June 2011 iControl announced the close of over $50 million in Series D funding, bringing total investment in the company to more than $100 million. They said this round of funding will accelerate the deployment of iControl's energy management solution and other broadband home management services, while also positioning the company for international expansion. Investors in this round of funding include Cisco, Comcast Ventures, Intel Capital, Charles River Ventures, the Kleiner Perkins Caufield & Byers iFund, Rogers Communications and Tyco International, the parent company of ADT Security Services. Connectivity Week 2009 Home Energy Ecosystem Mass deployment of smart meters by utilities is creating new business opportunities for product developers and utilities. Extending the meter into the home will require a new class of products that feature energy awareness. First of all, let me introduce myself. I am Siti Na’ilah from the Market Research Department of the Malaysian Communications and Multimedia Commission (SKMM). On behalf of SKMM, I would like to seek for permission on one diagram, title; “Home Energy Management”, extracted from your blog post for use in our newsletter. We trust by showcasing this graph as an example, it will provide the readers the visual view of this topic. Your immediate feedback is highly appreciated. Thank you. Malaysian Communications and Multimedia Commission (SKMM), Cyberjaya, Selangor, Malaysia. • Cold load restart smoothing. Wow Great information.Thanks for your post. Wow what a really nice blog. Home Energy Management is the seriously very nice work. I really appreciate this work. The blog has seriously very nice and interesting content. The information given in this is really valuable for the users like me. Energy Saving Solutions is the best way to promote the eco friendly technology. We should start these types of methods to take the technology in new hight.